We break down some of the top free agents in 2018. How will their dynasty value be affected? In this Off-Season Primer series, I’ll make sure you and your dynasty teams are ready for all that might happen by giving you an advance look at players that could be on the move in the upcoming months. The 2018 NFL League Year officially launches on March 14, which includes the beginning of free agency. With many of the dynasty-altering class of 2014 players hitting the open market for the first time, this free agency period should have long-lasting impact on dynasty teams along with the NFL. Here are some of the top players who could become available this off-season. There were early-season rumors that the Saints might be ready to move on from their quarterback Drew Brees, but after the way the team has played this season, it is difficult to imagine that happens. This is likely a situation where both sides are looking for a new deal. Thanks Ryan! 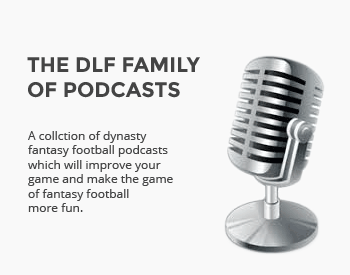 We are ready for another offseason with DLF. Here is a dream scenario…. Titans lose today, fire Mularkey and coaching staff, interview McDaniels next week while Pats are on a bye, hire him and sign Dion Lewis during Free Agency to complement Derrick Henry. How about that?!!! These are my favorite type of DLF pieces. So well-timed and thought provoking. Thanks Ryan! On Sammy, I bought in just before the trade to the Rams and my excitement quickly turned to disappointment and mostly stayed there as Sammy took a backseat to Robert-freaking-Woods!? To me, Sammy’s disappointing year 1 production in McVay’s O, comes down to this: was it Sammy or was it his role? I believe it was the latter. My growing belief is if Sammy stays, both his role and numbers will improve significantly next year. Then again, I could be just another delusional Sammy owner. We are legion. On ASJ, you nailed it. His late season fade is perplexing, but he’s gotta be appealing to the Jets with his blocking and redzone reliability. Maybe he’ll hang on to a few more TD’s. On A-Rob, with the rise of so many productive WR’s (Hurns, Marqise, and now Westbrook and Cole) on the other end of Bortles’ passes, one has to legitimately wonder how much was Bortles (or the system) and how much was A-Rob and therefore discount A-Rob’s dynasty value at least a little. Sure to take flak for that one. On J-Matt, not sure what to make of him. Is it all really as simple as the dude’s been in injury hell for a few years? Assuming he can and will return to health for the upcoming season, there are several potentially great landing spots for him, including the 49’ers, Lions and maybe even the Dolphins. Then again, one has to legit wonder if his injuries are here to stay. Is that knee permanently damaged? It happens.